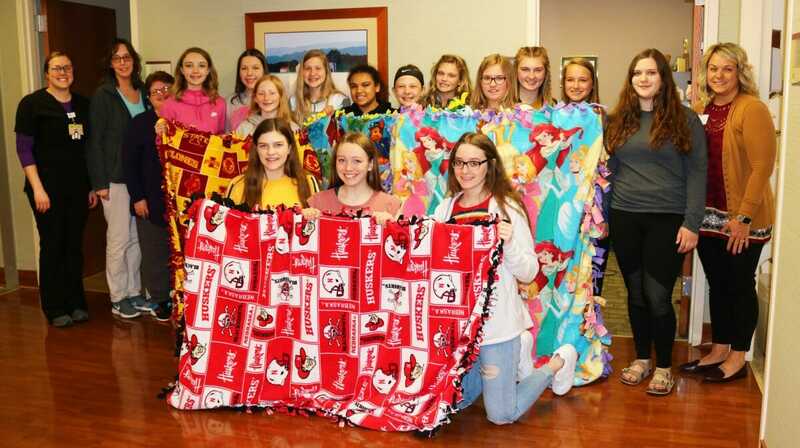 In early December, Burgess Foundation and Burgess People Care teamed up with the West Monona High School Family Career and Community Leaders of America class (FCCLA) to provide 30 hand-made fleece blankets for the children that are seen in the Burgess Health Center Emergency Room. Karla Copple, Director of Emergency Services at Burgess Health Center, accepted the blankets from the students. 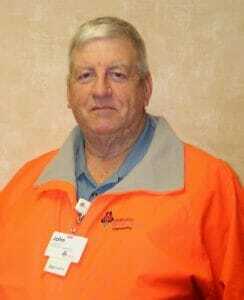 Copple and the ER staff are now ready to provide additional comfort to children entering the ER. The cost of the fabric was approximately $1,000 but is priceless according to Burgess People Care member, Janie Schlitter. PHOTO front row from left to right: Abby Wessel, Emma Black, Amber Disney. Middle row: Laura Heisterkamp, Morgan Warner, Ally Darwin, Maggie Lage, Joanna Koenig, Kloie Lester, Skyla McClure. Back row: Kelsey Gray, Janie Schlitter, Lori Jensen, Averie DeBartolo, Jayleigh Anderson, Devyn Beck, Tasha Miller, and Karla Copple, Director of Emergency Services. Burgess Foundation is committed to seeking community partners whose time, talent and treasures ensure the future of Burgess Health Center. Burgess People Care is a long-time employee committee of Burgess Health Center that raises funds to support community drives, events and fellow employees. Burgess Health Center, located in Onawa, IA, is a rural acute care hospital that is accredited by the State of Iowa, and also has family clinics that serve the communities of Dunlap, Sloan, and Mapleton, IA as well as Decatur, NE. The staff is committed to improving the quality of life for the people and communities served, by providing excellent healthcare and exceptional patient experiences. April is National Occupational Therapy Month, to promote awareness of occupational therapy. 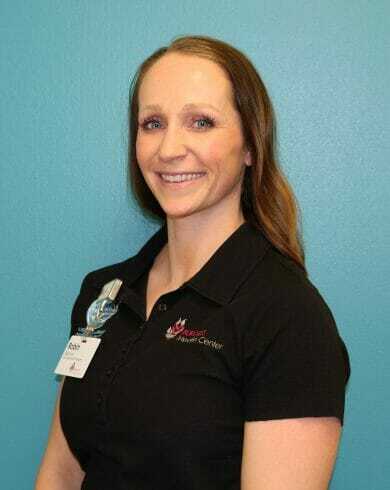 Burgess Health and Rehabilitation Center is honoring our very own occupational therapist, Robin McLey who is dedicated to improving the lives of her patients. Read McLey’s responses to common questions about the profession below. Q.) What is occupational therapy (OT)? Occupational therapy is more than exercises! Patients that are appropriate for OT vary from musculoskeletal diagnoses to cognitive diagnoses. Occupational Therapists play a vital role in mental health, and many patients may benefit from a referral to OT if they are dealing with mental health issues. Coping mechanisms, therapeutic use of self and interventions that focus on effective communication may be beneficial to a variety of different mental health diagnoses. Occupational Therapists can also address vision impairments and assist with retraining or adaptations for visual issues. Peripheral vision loss, visual tracking issues, visual attention delays and general safety recommendations for visual changes are just a couple ways OTs can assist with vision issues. Children can also benefit from OT. Occupational Therapists can assist children in progressing handwriting, grasp and motor skills, and developmental milestones. Sensory interventions are also appropriate for children who have issues with sensory processing. Perhaps a child is having a difficult time with attention to a specific task in the classroom. An OT referral may be beneficial in identifying what is distracting the child and what intervention or treatment options are useful for solving the issue. Q.) What kind of patients do you typically see? I play many roles at Burgess and see a variety of different patients. I serve inpatient, outpatient, and home health clients. Goals for my clients vary depending on the setting. In the outpatient setting, I see a variety of upper extremity diagnoses as well as generalized weakness and cognition issues such as memory or problem-solving. Inpatient clients typically present with weakness and issues with their abilities to care for themselves, while my focus for home health is assessing clients’ need for equipment and problem-solving how to make them as safe and independent as possible. Q.) What is your favorite part of your job? Easily the patients and people I work with! I love the variety of patients that I see daily, and I enjoy the unique relationship I build with each one of them. I also love my coworkers! At Burgess, we strive to be progressive and innovative. Each one of my coworkers genuinely care about the patients we see and the community we serve. Burgess Health and Rehabilitation Center is grateful for and appreciative of Robin for her dedication and hard work. Whether you are recovering from surgery, injury, illness, or stroke, let us help you regain your mobility, strength, and daily function. Ask your family physician for a referral to Burgess Rehabilitation Services today. 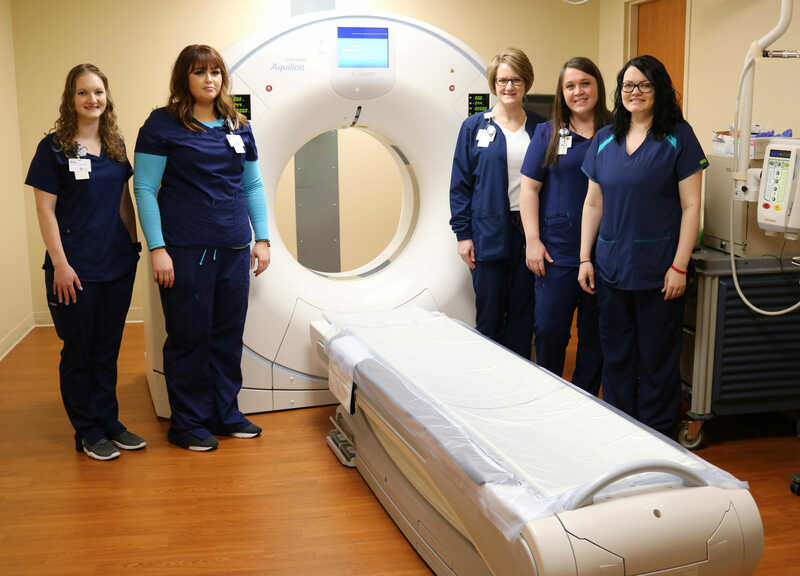 Patients of Burgess Health Center will now have access to safe and comfortable exams with the recent installation of Canon Medical Systems AquilionTM Lightning CT system. The 80-detector-row CT is designed for full-body imaging and routine volumetric scanning with the premium CT technology found on high-end systems so that providers can deliver a better patient experience. The Aquilion Lightning delivers fast reconstruction speeds of up to 50 images per second at full resolution, and with the industry’s thinnest slices at 0.5 mm and a 78 cm bore, it optimizes workflow and patient comfort. To simplify exams, the system comes standard with Adaptive Diagnostic solutions, such as Single Energy Metal Artifact Reduction (SEMARTM). Pictured left to right: Elsa Roslansky, Ali Sears, Jenny Coble, Katie West, and Molly Savery. Burgess Health Center, located in Onawa, Iowa, is a rural acute care hospital that is accredited by the State of Iowa. Burgess Family Clinics serve the communities of Dunlap, Sloan, and Mapleton in Iowa as well as Decatur, Neb. Burgess has retail family pharmacies in Dunlap and Whiting, Iowa. The staff is committed to improving the quality of life for the people and communities served, by providing excellent healthcare and exceptional patient experiences. Canon Medical Systems USA, Inc., headquartered in Tustin, California, markets, sells, distributes and services radiology and cardiovascular systems, including CT, MR ultrasound, X-ray and interventional X-ray equipment. For more information visit Canon Medical Systems website at https://us.medical.canon. Canon Medical Systems Corporation develops and manufactures diagnostic imaging systems including CT, MRI, ultrasound, X-ray systems, and clinical laboratory systems and provides them to around 140 countries and regions around the world, offering technology that provides faster diagnosis and early treatment. Under the slogan “Made for Life” (Made for Partnerships, Made for Patients, Made for You. ), Canon Medical Systems is making positive contributions toward hospital management, and provides a range of patient-friendly healthcare systems and services, continuing its long tradition of contributing to healthcare. Grief is a journey that doesn’t have to be traveled alone. 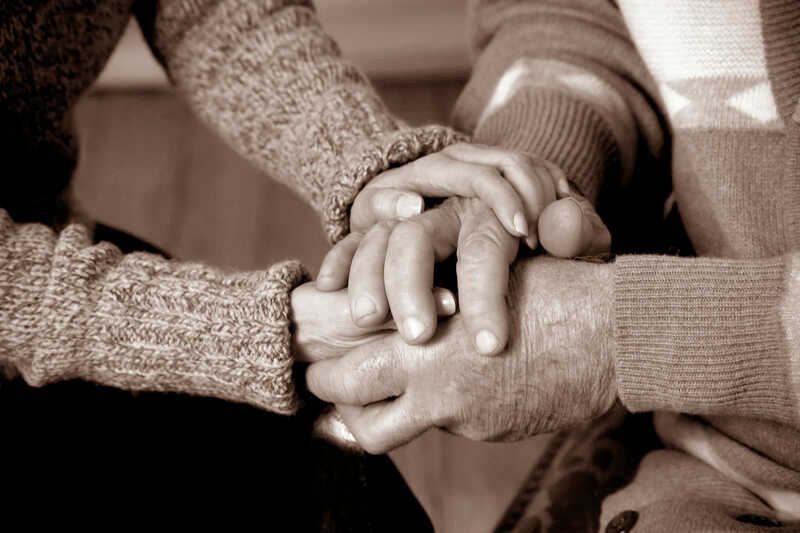 Often, talking or being with someone else who has experienced a loss can be helpful. 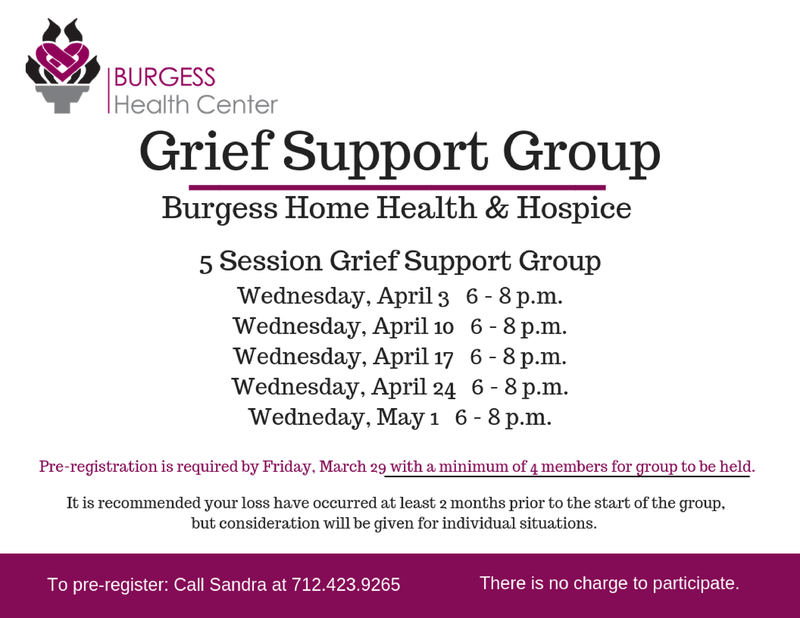 Burgess Home Health and Hospice is offering a 5-session grief support group for adults. Sessions will be April 3, 10, 17, 24 and May 1 from 6 – 8 p.m. The support group will meet in the conference rooms at Burgess Health Center in Onawa, Iowa. There is no charge to participate. Please bring a photo of your loved one for the first meeting. 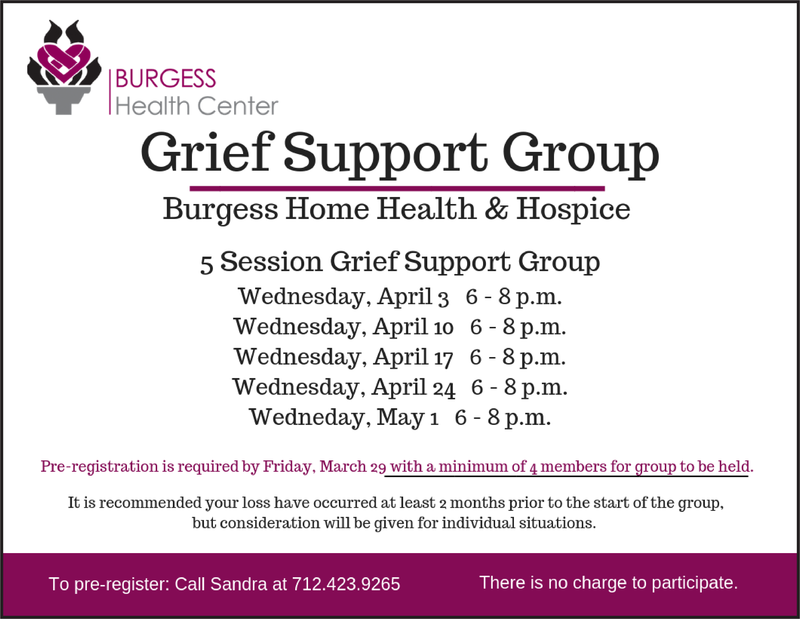 While there is no time frame for when you experienced the loss of your loved one, it is recommended the loss have occurred at least two months before the start of the grief group. Participants must pre-register by Friday, March 29. A minimum of four members is required for the group to take place. 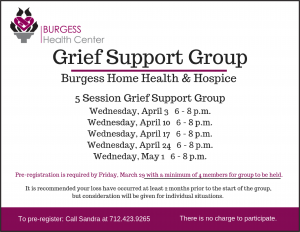 If you have questions or would like to register, please contact Sandy Beechy at Burgess Hospice by calling 712-423-9265. In early December, Bomgaars held a night of festive fun and holiday shopping for ladies, and today, the radiology department at Burgess Health Center received a generous donation. Bomgaars joined with local cancer centers and hospitals to raise awareness of women’s health issues and passed along a 20% discount for the ladies in attendance on December 2 from 5-8 p.m. A donation of the evening’s total sales was pledged back into the community to help local agencies. The donation of $259.70 will go towards the purchase of a new breast exam module that aids women in the recognition and detection of breast disorders, sizes of nodules, and other abnormalities during a breast examination. Breast cancer cannot be prevented; however, Burgess Health Center continues to provide and invest in the latest technologies, education, and support services for early detection. 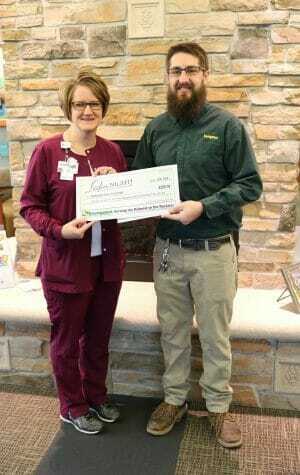 PHOTO: Jenny Coble, Director of Radiology accepting the donation from Eric Ridder, store manager at Bomgaars Onawa. Diabetes is a disease that will not go away, but it can be managed by taking proper and necessary steps. Burgess Diabetes Center offers the latest in technology to help patients manage their blood sugars. A Continuous Glucose Monitoring System (CGMS) consists of a sensor worn on the back of the upper arm. The sensor uses a thin flexible filament inserted under the skin and measures glucose every minute. The blood sugar data from the sensor is downloaded to a computer and a print out shows a full 24 hours of blood sugars. The sensor can be worn for up to 14 days. John Maule, a five-year diabetes patient, has had previous struggles with keeping track of his blood sugar. After wearing the professional CGMS, it motivated him to get a personal version and download the phone app. “I’m afraid of needles, so pricking your fingers all the time was a big step for me,” said Maule. “Then on top of it, you have to keep track of the strips.” It got to be too much of a hassle for Maule that eventually he became inconsistent with testing his blood sugar altogether. When a diabetes patient is inconsistent or just stops checking their blood sugar, they are taking a major risk. Michele Kirkendall, Burgess Health Center diabetes educator, and dietician said not checking your blood sugar can lead to problems with a diabetes patient’s vision, heart, kidneys, and circulation in hands and feet. “You can also feel extremely tired and just not feel like doing anything,” said Kirkendall. Since beginning the sensor in May, Maule has noticed an improvement in his daily life. “I think the biggest thing is I know what to eat when to eat and how I react to what I eat.” Before he was just guessing and paying the consequence later. The sensor relays important information to the reader, such as graphs and charts. All of these conveniences have changed the way Maule feels about checking his blood sugar. Personal Continuous Glucose Monitors are becoming a very useful tool to help individuals monitor their blood sugars. If you or someone you know could benefit from this technology, contact our diabetes educators at Burgess Diabetes Center. A baby girl, Kylie Mae Funkhouser, born January 1 at 9:37 a.m., was the New Year’s Baby at Burgess Health Center. She weighed 6 lbs., 3 oz. and was 19 inches long. 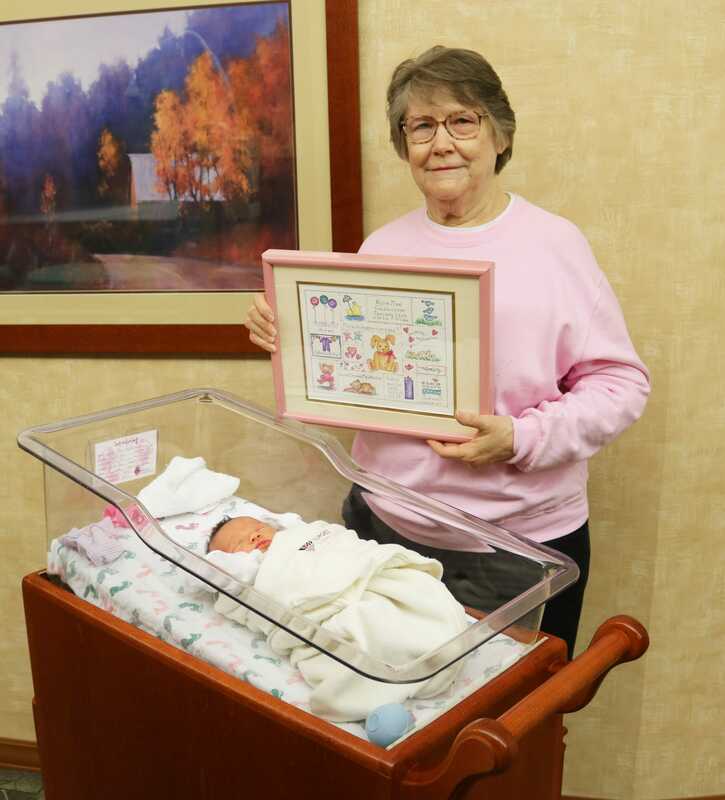 As the Burgess Family Beginnings New Year’s Baby, Kylie, and her parents received a personalized work of art made by Sue Cutler, chairperson of Burgess Health Center Auxiliary New Year’s Baby Gift Committee. If you would like to find out more about Burgess Family Beginnings or the Burgess Auxiliary visit www.BurgessHC.org. Photo: Sue Cutler presents the New Year’s Baby artwork to Kylie Funkhouser. Burgess Health Center will conduct a life-saving blood drive at Burgess Health Center, 1600 Diamond St, Onawa, on Friday, January 11, 12:30 – 5:15 p.m. Also, all donors will receive a coupon for one free ice cream cone redeemable at the Onawa Dairy Queen. The need for blood locally remains constant. Burgess reminds donors to eat a meal and drink plenty of water prior to giving blood. Photo ID is required at donation time. People can donate a pint of blood every 56 days, so roll-up those sleeves and save lives. Schedule your appointment online at www.lifeservebloodcenter.org or call 800.287.4903.